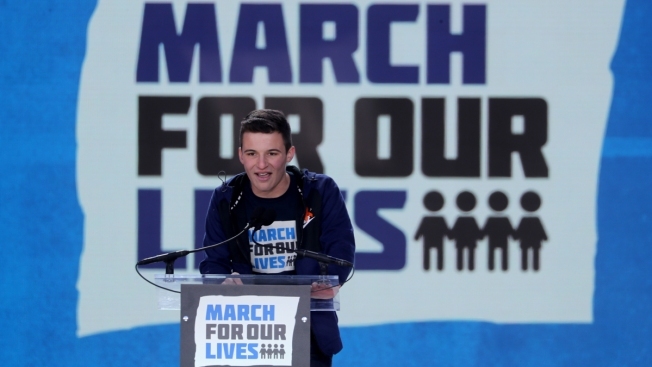 This March 24, 2018, file photo shows Marjory Stoneman Douglas student Cameron Kasky speak during the Washington, D.C., March for Our Lives rally to demand stricter gun control laws. A Parkland school shooting survivor is helping to raise money for victims killed at a Jacksonville video game tournament. Cameron Kasky and top Madden player Shay "Young Kiv" Kivlen are partnering with the fundraising platform Tiltify to host a livestream campaign for the victims. Kivlen and Kasky will host their own Twitch esports livestream event starting Monday to support the Jacksonville Fallen Gamers Fund. Tampa Bay Buccaneers wide receiver Mike Evans will also make an appearance. Authorities say Taylor Robertson and Elijah Clayton were killed Sunday when a fellow gamer opened fire at the Madden NFL 19 tournament. Eleven others were injured. The company says 100 percent of all donations will go to the victims' families to help with medical and bereavement costs. Kasky was a student at Marjory Stoneman Douglas where a gunman killed 17 in February.